Luxurious Home with 2102 sq ft on the main & second floor and 1700 sq ft in the walk out lower level totaling 3802 sq. ft. of finished living space. 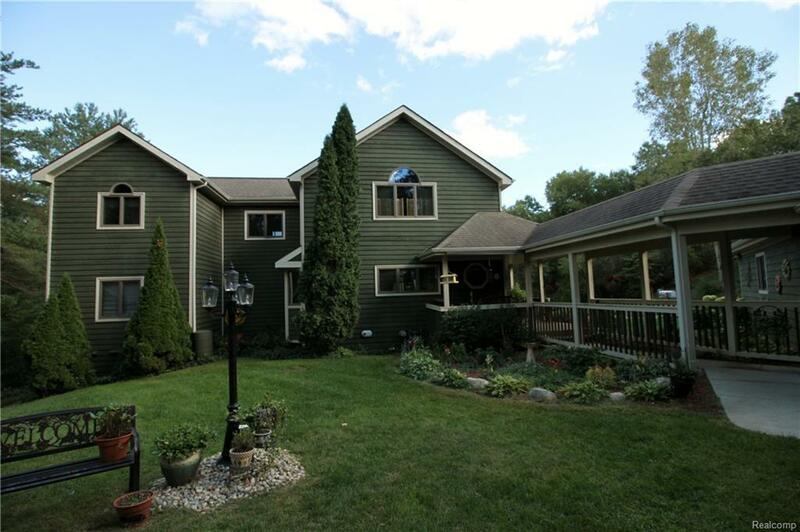 Perfectly landscaped with decks, porches, patio and garden area. Enjoy an evening fire around the custom fire pit over looking the pond. Great room windows & doors replaced 2017 include triple pane glass. Other updates include new garage door in the pole barn/workshop, pavement to pole barn, insulation in the main garage and fresh paint on the exterior. New aireaor in pond. The great room offers breathtaking views of the estate and pond. There is a beautiful floor to ceiling stone fireplace in the great room. Large master bedroom offers comfort, storage and attachment to the master bathroom. Master bath completely remodeled in 2017. Private office/study. Open kitchen has granite counter tops and stainless appliances. Plenty of space for entertaining. Up north feeling yet minutes from all shopping & dining.